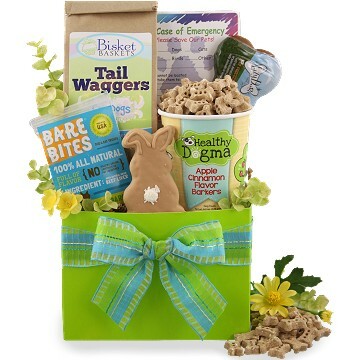 Yes we even design Easter baskets for dogs! This adorable Easter dog gift is filled with a fun assortment of biscuits with even a hint of dare we say…. Rabbit? Okay we know how much Fido loves to chase rabbits around the back yard and in the park but this rabbit you will love to have him catch. We’ve included an a rabbit shaped biscuit for Fido’s crunching pleasure. Celebrate this Easter with the whole family this year and that includes Fido too!